Would you like to make an extra $500 now? Starting your own freelance business might be the way to do it. People say that landing your first freelance client is difficult. I was nervous when I broke into freelancing but also excited to start making money doing something I loved. As you may or may not know, freelance writers, editors, virtual assistants, proofreaders, graphic designers, etc. all work as sole proprietors and don’t receive any employee benefits. However, freelancers often have the freedom to choose who they want to work with, set their own rates and choose when they work. Freelancing offers a super flexible lifestyle and makes it possible to earn more money than you would at a traditional job because when you work hard as a freelancer, there’s no limit on the amount of money that effort can earn you. In this post, I’m going to explain the steps you need to take to make an extra $500, or more, and win your first freelance client. The first thing you need to do before you start looking for clients is narrow down your niche. What type of freelance services do you want to offer? Are there any subjects or themes that you enjoy more than others? Do you enjoy proofreading? Proofread Anywhere offers free courses to help you learn how to land well-paying proofreading jobs. Are you an expert in a particular field? For example, a daytime lawyer looking to get into freelance writing could be seen as an expert in the field of law. Writing articles about your area of expertise for online publishers could become a lucrative stream of income for you. Narrowing down your niche and service offerings can also help you visualize your ideal client. Focus on which problems you hope to help them solve and how your service will make their processes run smoother. Freelancing online and working from anywhere is great, but you probably won’t have much luck landing your first few clients without samples to prove your skills and performance. Starting your own blog is a great way to create an online portfolio that you can use to market your services to future clients. It would be a good idea to set up a website or online portfolio if you haven’t already – here’s our in-depth guide on how to start a blog if you’re not technically inclined. Also, be sure to update your LinkedIn profile. When you reach out to cold leads, they are bound to research you online; LinkedIn is a great way to make a good first impression and also showcase your skills. One of the easiest ways to land your first client is to simply tell people you know that you’ve started freelancing. Whether you actually know someone who can benefit directly from your services or not, be sure to tell your entire network. I have a friend who spread the word when she started doing freelance social media management work and found out that her mom knew a business owner who wanted to hire her. Send emails, post on social media and tell people in-person to keep you in mind for freelance opportunities. Also, consider writing letters and mailing them to contacts for a lasting impression. This idea was recommended at a summit I attended a few weeks ago. The presenter argued that people often tend to skim through email in an effort to clear their inbox but will probably pay better attention to a personalized letter they receive in the mail. One of the most common ways to land a new freelance client is by emailing them a pitch. Pitching is how I landed most of my clients and it’s basically a quick sell on your services to a potential client. I wouldn’t recommend pitching just anyone, but once you figure out who your ideal client is, you can do some research and narrow down your leads. For example, if you are a graphic design freelancer targeting local start-ups, you’ll know that you need to locate small businesses in your area who may need a new website or other digital graphics. You can search for information on specific client leads on social media, via conference attendee lists, and on their actual website. With pitching, I always favor quality over quantity so spend a few minutes each day searching for leads then create a pitch you can send out in batches in order to land a new client. When I first started freelancing, I didn’t have much luck on job boards basically because I didn’t really try and just stuck to pitching instead. However, job boards can be a solid option if you have no idea where to start looking for freelance clients. The key is to avoid job boards that require you to bid on gigs with other freelancers. Some people are only interested in paying the lowest price for projects and you’ll get stuck delivering high-quality work for peanuts. Networking as a freelancer can be crucial to your success. My first freelance client actually approached me and it was thanks in large part to having my own website with writing samples and having a solid network. To help you land your first client, you can attend events for freelancers in your niche like conferences, presentations and local meetups. Niche meetup groups are often free to attend. Instead of focusing on handing out as many business cards as possible, focus on work to build real relationships with other people and don’t forget to follow up after the event. You won’t believe how many people actually don’t follow up with people they meet at networking events and you don’t want to miss that easy opportunity to land a client. I recently started applying to gigs on reputable job boards and it seems like many of the clients who are serious about working with freelancers require a trial period to ensure we’d be a good match. This is a good thing for many reasons especially if you’re trying to land your first client. With a trial period, you can prove yourself and get some guaranteed work while boosting your experience level. If you’re pitching and the client seems on the fence, offer a trial period for you both to work together so they don’t feel pressured to commit right away. Just keep in mind that any trial you do should be paid at a rate you both agree on. You’re still doing work and shouldn’t have to give your services away for free in the hope of landing a new client. Making your first $500 as a freelancer can happen quicker than you think and it all relies on these two main factors: setting your rates and planning your time. Setting your rates depends heavily on the project and how long it will take you to deliver outstanding results. Sometimes you’ll work on a per project rate while other times, you’ll work by the hour. Be careful not to compete with other freelancers on who can offer the cheapest pricing. Calculate the hours you’re looking to work per week and divide it by your monthly income goal. Also, consider the fact that you may have to pay for additional costs and services like web hosting, advertising, etc. along with taxes. In terms of hosting, for example, you can keep costs low when using Bluehost – who offers rates as low as $2.95 per month when you sign up through our link. Talk to a tax professional to determine how much money you should set aside from your earnings for taxes each month. As a general rule of thumb, freelancers can expect to save at least 25% – 30% of their gross income for taxes. With that being said, let’s say you want to earn $500 from freelance writing in just a month. If you charge a flat rate of $50 per article, that means you’ll need to write at least 10 and perhaps more if you want to use your income to cover other costs associated with freelancing. Say you landed two clients who need weekly articles. One has a smaller budget so you charge $50 per article while the other requires more research and in-depth analysis so you charge $100 per article. Just by bumping up your rate, you’re now able to write eight articles and earn $600. If you’re a virtual assistant and want to earn around $500 per month, setting your hourly rate at $15 means you’ll need to work around 34 hours to earn that amount. If you bump your rate up to $18 per hour, you’ll only need to work 27.7 hours. Increasing your rates should go hand in hand with increasing your value. The more you freelance, the more experience you’ll have and that’s valuable. You may also want to add in extra services for the client which could be something as simple as adding an extra revision, social shares, responding to comments on articles or finding graphics. Be mindful that some jobs you pitch for (especially on job boards) will already have a set rate in mind depending on their budget. If that rate doesn’t sit well with you, let the client know and move on. Use a combination of the strategies above to search for new clients in a variety of ways and you’ll be well on your way to making your first $500 as a freelancer! Have you ever thought of becoming a freelancer as a side gig or do you currently do any freelancing work? What are you most afraid of or unsure about regarding freelancing? Where have you been able to find freelancing clients? 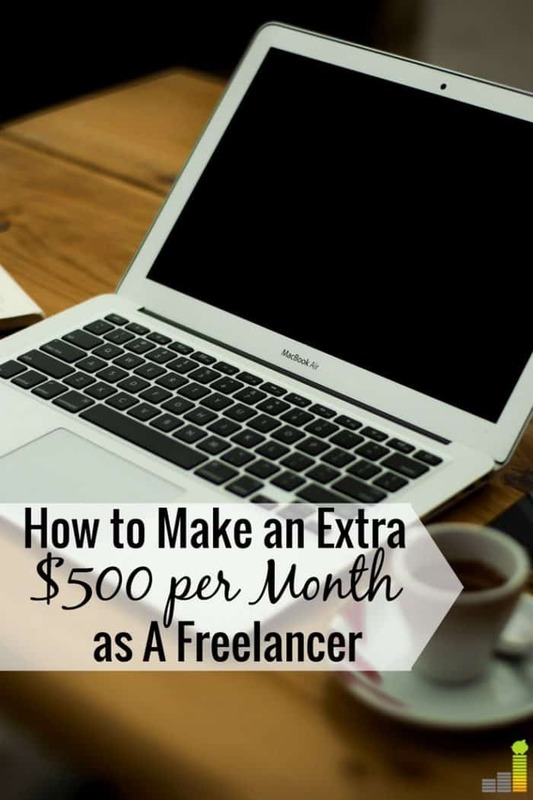 The post How to Make an Extra $500 Now and Get Your First Freelance Client appeared first on Frugal Rules.